Welcome to the Invasive Species Atlas and home page for the BC Spartina Working Group, a multi-partner initiative in BC and the Pacific Coast to find and control Spartina species. The map layers on this atlas include many different species in many locations but are by no means complete. The Spartina genus has its own layer group because of the threat it poses to coastal habitats. Layers for 2010 to 2012 are substantially complete but data compilation of earlier years is a work in progress. Additional layers will be added over time so if you are wondering about layers and data for other species or species groups not present send a note rknight@telus.net. This atlas now supports on-line data entry (user password required) and new table views of data that can be queried, filtered, sorted and exported to a users computer. If you “mouse-over” points in some layers in the atlas a “tool-tip” will appear that contains a link to a table of data for that point. At the bottom of the table that opens you find a link to a larger table of records for invasive species. The Atlas Documnets section below holds a variety of resources supporting inventory and mapping of Spartina. The Spartina ID & Mapping Method file describes how to use your GPS to map clone locations and includes identification and removal information. 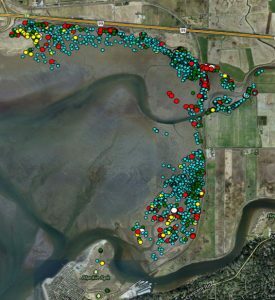 You will find the BCSWG Spartina Progress Reports starting in 2009 in this section. From a week of herbicide treatment on S. anglica at Roberts Bank here is coverage by Global TV news. It provides a good overview of the methods required to effectively control S. anglica http://globalnews.ca/video/797193/invasive-weed-battle . We expect to see a significant reduction in the number and size of clones on Roberts Bank in 2014. 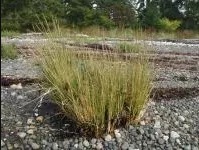 Between February 27th and March 11th, 2015 Burrard Inlet Stakeholders and the general public contributed to the development of a management plan for the eradication of Spartina patens in Burrard Inlet.